Caribbean economies are expected to grow, on average, by around 2.3% in 2014, and Belize’s economy by 2.5% in 2014 and 2015, according to the recently released annual report of the Caribbean Development Bank (CDB). 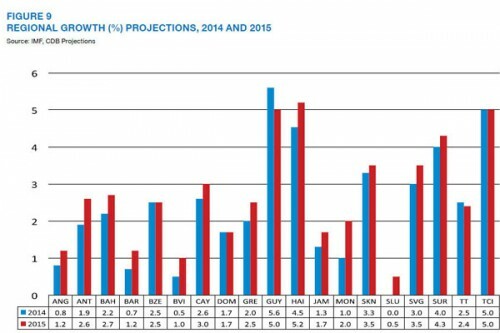 Last week, the Statistical Institute of Belize (SIB) told journalists that the Belize economy had contracted by about 0.4%, but noted that the slight downturn may improve by year-end. The CDB’s preliminary estimates indicate that the region grew by an average of 1.5% in 2013, up slightly from a revised figure of 1.2% for 2012. The CDB report also noted that Jamaica’s agriculture sector took a hit due to Hurricane Sandy in 2012 and drought in 2013, and weather was also a factor in Belize, resulting in declines in citrus and banana output. Rather than lower oil prices, ongoing maintenance and reduced oil field yield, respectively, led to contractions in mining output in Belize and Trinidad and Tobago, said the report. It added that improved overall growth performances in these two economies reflected the general upturn in construction and tourism activity. “There was also strong growth in private construction activity, including residential construction in Antigua and Barbuda, Belize and Guyana, together with significant FDI-driven [foreign direct investment] tourism-related development in The Bahamas, Belize, Cayman Islands, Grenada, St. Kitts and Nevis, St. Vincent and the Grenadines and Turks and Caicos Islands,” the CDB report added. It noted that destinations such as The Bahamas, Barbados, Belize and St. Kitts and Nevis recorded strong growth in cruise arrivals, whereas others such as the British Virgin Islands (BVI), Cayman Islands, Dominica and Grenada registered significant declines. In the area of unemployment, the CDB noted that five countries recorded double-digit unemployment rates. “The Bahamas’ annual jobless rate as measured in May was 16.2%; the annual averages for Barbados, Belize and Jamaica were 11.7%, 12.9% and 15%, respectively; and the unemployment average to September for St. Lucia was 23.8%. 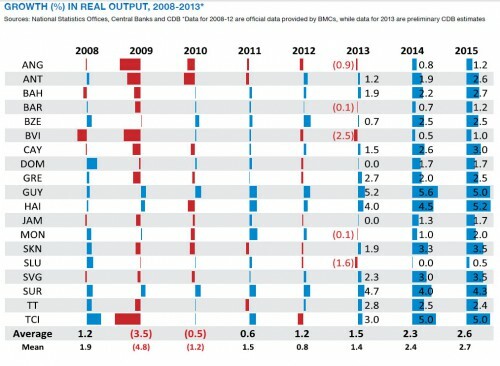 The rate for Belize represented an improvement over the corresponding period in 2012,” the CDB added. It also said that successful debt restructuring in Belize, Jamaica and St. Kitts and Nevis, as well as satisfactory progress on IMF-sponsored adjustment programs by Jamaica and St. Kitts and Nevis, underpinned improved debt dynamics and prompted credit rating upgrades for Belize and Jamaica. “In the fiscal year ended March 2013, Belize’s fiscal performance was marked by a narrowing of the primary surplus but an improvement in the overall balance, as reduced interest expenditure related to the restructuring of the external debt in March 2013 led to a decline in overall expenditure,” the CDB said. It noted, though, that because of unanticipated outlays for reconstruction and rehabilitation works which had to be done to address adverse effects of torrential rains which struck Belize in the latter part of 2013, there were some subsequent slippages relative to budgeted outturns. This, the CDB said, partially reversed the improvement in Belize’s debt ratio. According to the bank, this will be achieved by the end of 2016 through the upgrade of 39 miles of sub-transmission and distribution lines, and the construction of 5.5 miles of transmission lines and sub-stations, as well as installation of transformers. The CDB said that it also approved interventions to assist Belize in improving its capacity in agricultural water management in the context of the development of an Irrigation and Drainage Master Plan (IDMP). Last week, the CDB also announced that Dr. Carla Barnett has resigned, effective May 23, 2014, as the bank’s Vice President (Operations). 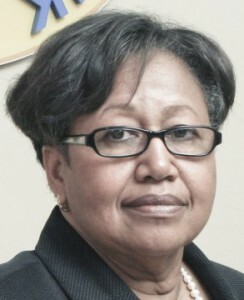 Barnett, Belize’s Former financial Secretary, had responsibility for Operations at CDB, with oversight of the Projects Department, Economics Department, Renewable Energy and Energy Efficiency Unit (RE/EE), Climate Finance, Gender, Quality Assurance and Oversight and Portfolio Performance Management. Dr. Barnett is the new chair of the Belize Tourism Board.